Adding coverage to a strapless gown. Or possibly just liking the idea of having two different looks on your special day. Wedding dress jackets can provide more coverage to a strapless gown for the ceremony. 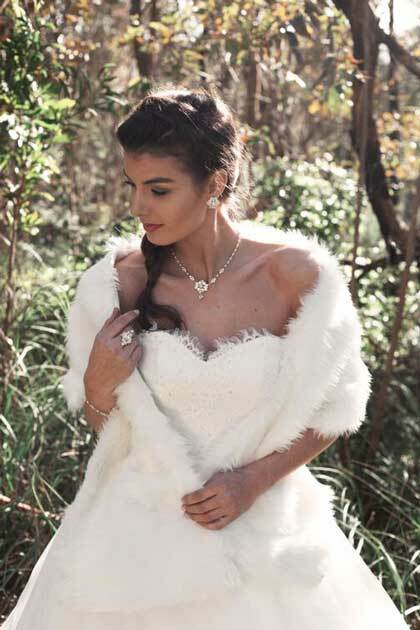 We have many different bridal jackets, wraps and boleros to choose from including fur for the winter or beach services. Possibly Lace is more the look you were going for. Long sleeve or short bolero styles can take a simple gown style to a next level look. 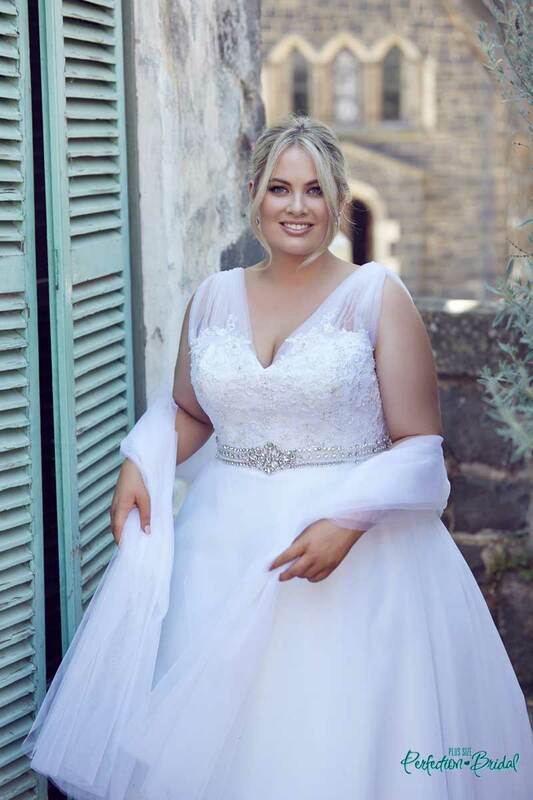 Many styles available at our Melbourne bridal shop. Fur, lace or fabric depending on the amount of coverage you require. A simple wrap is an attractive and affordable way of keeping warm outdoors. When choosing a wrap consider the length as it will be important on the day. Too short and it wont meet at the front a long wrap should have the ability to cross over at the front. We have plus size wraps in store. Also, cut ones that tie with a ribbon for a more vintage look. A bolero is a short sleeve jacket. 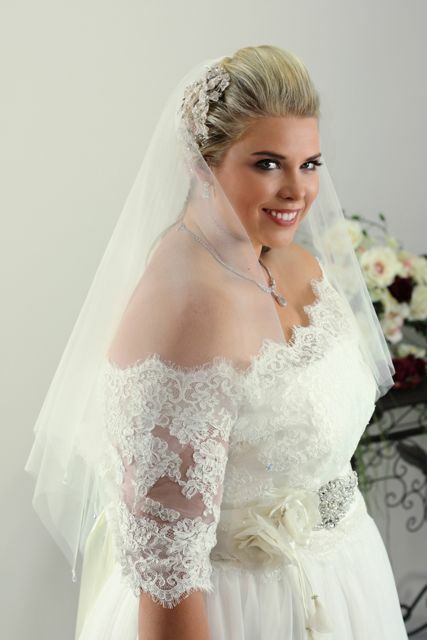 Usually made of lace providing back coverage to a strapless gown and a shorter sleeve length. Our alterations department can add a lining if you need a more opaque look to cover under garments. Which really is just a different term for all of the above. 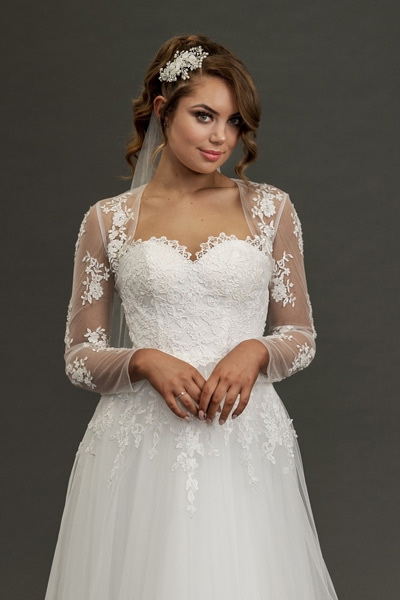 We have featured our off the shoulder stretch lace topper with the Julia strapless gown.